The macula is a yellow patch in the centre of the retina where the cells known as “rods” are concentrated. This is the region responsible for seeing details and contrast.Several diseases can cause changes in the macula. These changes cause a condition known as macular degeneration, and lead to a gradual loss of the central vision.The most common form of degeneration is related to age. Removal of waste products from the retina is impaired in older people, and this affects the macula.The condition is known as AMD (age-related macular degeneration). Age-related macular degeneration is after cataracts the second most common cause, of impaired vision in the over 70s. There are two forms of macular degeneration, the wet form and the dry form. The dry form is the most common: It develops slowly and seldom leads to serious impairment of vision. Symptoms of the wet form appear suddenly and the condition can rapidly lead to serious loss of vision if not treated. Symptoms of the dry form include a slow loss of visual acuity. The symptoms of the more aggressive wet form can appear suddenly. Extensive changes in near vision and image distortion can be symptoms of the first stages of macular degeneration. The loss of detail vision takes place gradually, and is mainly noticed during reading and close work. Macular degeneration does not affect locomotor vision. Dry macular degeneration: there is no medical treatment for this condition. 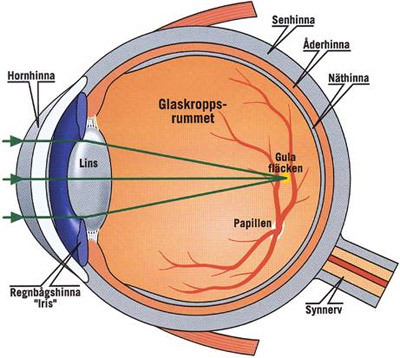 Wet macular degeneration: We treat this condition at Stockholms Ögonklinik using the latest technique, in which Lucentis® is injected into the vitreous humour. Sweden’s first private alternative for vitreoretinal surgery and medical macular treatment. This led to greater resources available for general medical eye care. We diagnose macular disorders using OCT and angiography, and we carry out macula treatment when appropriate.We use the most modern and high-quality equipment at Sophiahemmet and the latest established techniques. The treatment will be carried out by consultant Dr Björn Steén, one of Sweden’s leading specialists with long experience of vitreoretinal surgery and medical macular treatment. Björn Steén has previously worked at S:t Eriks Ögonsjukhus and has given Ipuls courses in intravitreal injection techniques. The appointment of Björn Steén enables us to further extend our services and expertise at Stockholms Ögonklinik. Our patients will receive vitreoretinal surgery and medical macular treatment of the highest quality possible. Shorter waiting times for surgery – from months to days. Stockholms Ögonklinik has long experience of treating patients from outside of Stockholm, and we can, for example, suggest reasonable and close hotel accommodation, suitable for patients who must return for a check up the day after surgery.